Duel Systems has notified us of the DuelAdapter's End Of Life (EOL) status. The product is still available in limited quantities, and Duel Systems will honor warranties. There will NOT be driver updates to support Mac OS X 10.6 or above, nor support for Windows 7 or Vista/7 64-bit editions. Please bear this in mind when purchasing this item. See our new product: ExpressCard 34 to PCMCIA PC CardBus 16/32-bit Read-Writer Express2PCC as a replacement for the DuelAdapter. 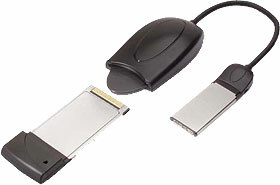 DuelAdapter is now at End Of Life, please see the notes at the top of this page!